Phil's band consisted of two trumpets, three saxophones, one bass fiddle, drums and a piano. Phil played the trumpet, and as the leader, the boys nicknamed him "Mother McComb." Agreeing to a contract of $7.00 a night per member or a 50-50 take when the crowds were small, it seemed hardly worth the band's time to travel from Edmonton to Seba Beach, but that's nothing new to a musician! Phil's dad provided the transportation for the boys in his 1929 Chevy. An interesting arrangement, musically speaking, with the bass fiddle strapped to the roof, the drums tied on to the back and the rest of the instruments strapped onto the running boards. This morning our great friend, Phil McComb, passed away. Over a year ago, Phil went into the hospital with fluid in his lungs; it only slowed him down temporarily. When he regained some of his strength, he returned to his position with the Shriners' Hospital, helping the sick kids in our community secure funding and accomodation for spcialized treatment at one of the world's several Shriners' Hospitals for Sick Children. Cancer treatment was hard for Phil, but his dedication to helping others continued as long as he could manage. Phil retired from playing with our band a couple of years ago, but continued to be an important influence, sponsor, and supporter of the band he helped grow from a small afternoon club into a successful, professional musical orchestra. Along with several prominent musicians of Edmonton, he crafted a non-profit foundation with the Orchestra to provide scholarships for aspiring young talent. Phil served as the chief librarian for the band's extensive musical book, directed the band, and served on the band's executive committee for several years. As a trumpeter, you could not ask for a musician who played with more passion. Phil also played in Dixie combos, but remained a solid foundation for the trumpet section of the Trocadero Orchestra for many, many years. He was a strong proponent of keeping the band's original mandate to "preserve the dance music of the big bands". An inspiration to all who knew him, Phil will continue to provide love, guidance, gentleness and passion through our fond memories of this one-in-a-million gentleman. 1929 Chevys were never noted for speed and because all the boys in the band had "day jobs", arriving on time for the dances was difficult. To deal with this problem, they discovered if they took the brake belt off the car, they could get the Chevy up to 45 miles per hour. This worked great until they reached Seba's famous "Caution Hill" - without brakes, the trip to the bottom could be a hair-raising experience to say the least. Seba's local policeman, aware of the band's customary race down the hill, attempted to catch them one night. Warned ahead, instead of coming on into the town, the boys ran the car up the fork in the road and hid it in the bushes, and waited. All turned out well and the band played that night -- only a little late! In the early 1940's, the old dance hall had a serious fire in the back of the building. It was decided to tear it down, rather than repair it. In the summer of 1944, a group of business men decided that Seba Beach needed a new pavilion on the lakefront. 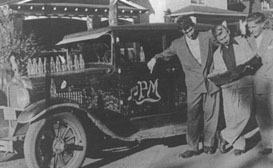 Harry Patriquin, Lee R. Dodds and Abe Miller set up a company in the name of, "The Seba Beach Community League Limited". The company was registered on August 1, 1945. Shares were issued to Seba Beach residents and a loan was secured for $3,000.00. Two lakefront properties on 105th Street were bought for $1,000.00, and building commenced. Vacationers had three places where they could obtain overnight lodgings. The first being the hotel, "The Lakeview inn," across the street from the Pavilion. The YMCA also ran a bed and breakfast, as did "Hurry Home" (down the beach in the Seba Addition property). Hurry Home was the most elite place of the three, and Mrs. Hurry's home-cooked meals were very popular. It was the only "hotel" on the beach, and it also had tennis courts (tennis was a very popular game in the twenties and thirties). Overnight accommodation for the band was not provided, which left them to the generosity of the cottage owners. Dan Smith often lent them one of his unoccupied cabins. When Dan's place was full, a young lady named Colleen McCarthy would help them find a place to stay. During the third year of the band's tenure, Bob Eby arranged to have the south end under the new hall walled off, three donated army bunks, a table, and two chairs became the overnight accommodation for the band. Bob and Helen Eby ran the concession, and they would provide the boys with a good breakfast in the morning. Long weekends meant a midnight frolic starting at 12:00am and ending at 2:00am. The charge was fifty cents a person and the snack bar was kept open. 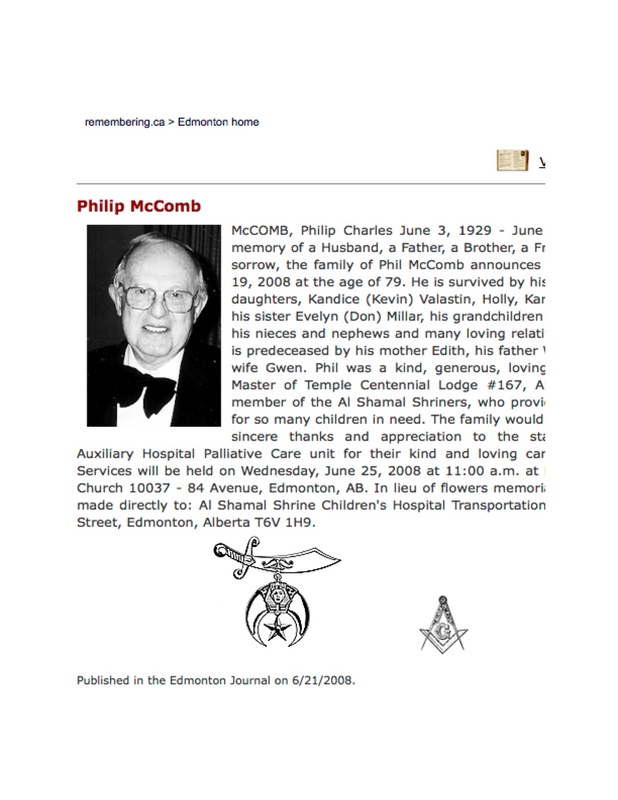 Phil McComb remembers dealing mostly with Abe Miller, Dr. Lee Dodds, and Bob Eby. He remembers this as a happy time and meeting many great people. Today, Phil resides in Edmonton, retired as the Alberta Vice President for Woodwards stores. Phil McComb is still playing his trumpet with a band made up of old timers in the "Trocadero Alumni Orchestra". 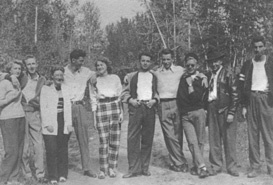 The new Pavilion opened during the summer of 1946 and dances were held weekly with Phil McComb's Band --- the first regular band to play in the new Community Hall. The band played from the mid-forties to the early 1950's.